An assessment of the site took place yesterday following the landslide on the A83 Tarbet-Campbeltown road on December 30. The A83 was due to reopen this morning utilising the Old Military Road diversion route. But last night motorists faced a 50-mile detour via the A82 Inverness-Glasgow road. 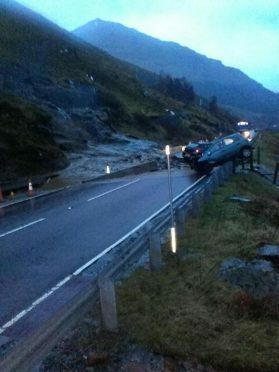 A spokesman for road maintenance company Bear said last night: “During a geotechnical assessment today at the site on the Rest and Be Thankful which was subject to the landslip on December 30, a 150-tonne boulder some 175 metres (574ft) above the A83 has been identified as being at risk of mobilising. “Following this assessment a decision has been taken to close the A83 overnight in the interest of safety. “This same risk currently applies to the preferred Old Military Road diversion route. The alternative diversion via Dalmally is currently being implemented. “The route will reopen around 9:00am tomorrow morning under convoy control utilising the Old Military Road local diversion route when the appropriate safety measures have been put in place. “Work will then commence to remove the boulder using explosives. It is anticipated that this will take around two days.